Dads favorite answer to any question you might have for him. This funny T-shirt design is perfect for Father's Day or any time you want to give your dad a funny T-shirt he will love. 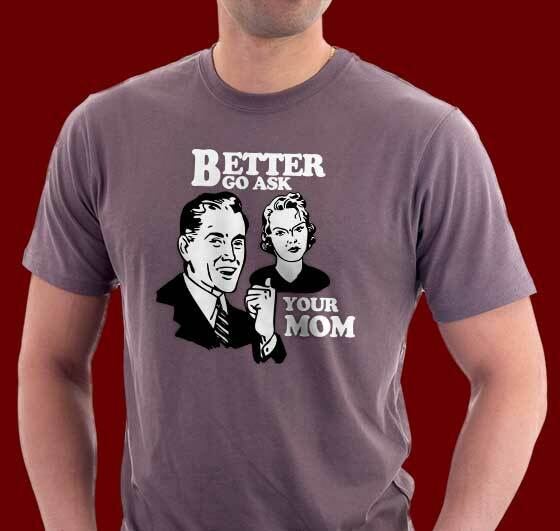 Better Go Ask Your Mom offers a cool retro illustrations and typeface to give this design of very cool and humorous look. Check out all the cool T-shirts we have in this design below. We have this design available on name brand shirts like Haynes and American Apparel, just to name a few. These are extremely high-quality shirts that hold up for a very long time.